Gee, adoption of a new technology in America held back by patent protectionism? Never! 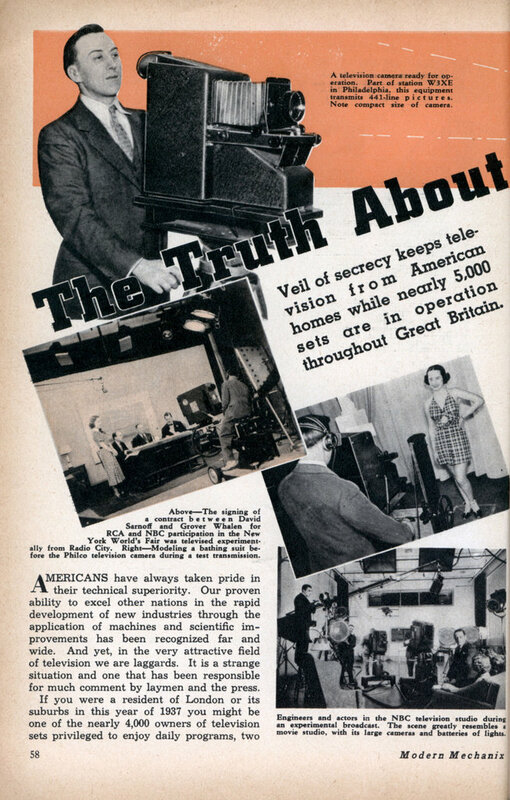 Veil of secrecy keeps television from American homes while nearly 5,000 sets are in operation throughout Great Britain. 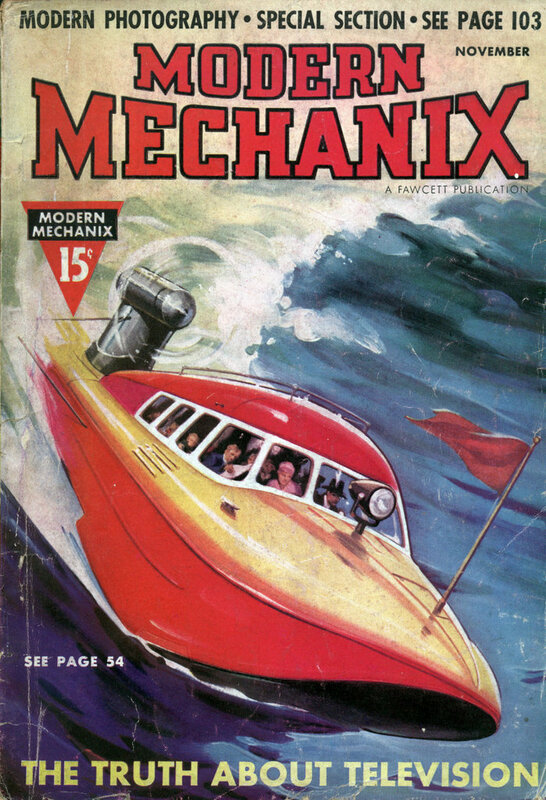 AMERICANS have always taken pride in their technical superiority. Our proven ability to excel other nations in the rapid development of new industries through the application of machines and scientific improvements has been recognized far and wide. And yet, in the very attractive field of television we are laggards. It is a strange situation and one that has been responsible for much comment by laymen and the press. If you were a resident of London or its suburbs in this year of 1937 you might be one of the nearly 4,000 owners of television sets privileged to enjoy daily programs, two hours in length. Your set would have cost you on the average of $400 in American money, but it would be an instrument which you could exhibit with pride. It would be a beautifully finished console, imposing in size, with a hinged top and numerous knobs and dials. Inside the cabinet are twenty-five tubes including one funnel shaped cathode ray tube, 12″ in diameter with only its white-coated top face visible when the lid is raised. The tubes mentioned include those necessary for the reception of television sight-and-sound and in addition a separate group for ordinary broadcast and short-wave programs. The moving images produced on the fluorescent face of the cathode ray tube are projected upward against a mirror inserted in the tilted lid. You and your friends, sitting in a slightly darkened room, look at this mirror and see there the artists as they perform in the studio while their voices issue from a loud speaker in the lower half of the console. If you were critical you would say that the images are about equal in brilliancy and detail to those of the typical home movie, although the dimensions are slightly smaller. This is television as England enjoys it today, while America, the land of great opportunities and the country which is always reputed to be at least a dozen jumps ahead of the field in any form of scientific research, is watchfully waiting and hoping for its great radio organizations to show as much. In other words, the much-vaunted Yankee ingenuity has lost caste as far as television is concerned. Compared to the nearly 5,000 televisors in daily use in England, the United States could mobilize no more than 150 units. Of this number, about 100 are experimental models assembled by the Radio Corporation of America for its executives and engineers. They are installed in the homes of these individuals for strictly confidential use and the utmost secrecy has been enjoined upon their possessors. Of the remainder of our allottment, some are in research laboratories and only a very few in the residences of individuals. Although thousands of amateur radio experimenters capable of assembling television receivers are waiting to begin work on this new art, they have been stymied by one fact. The firms who know how the work should be done will not release the information to the public. Moreover, there is no power on earth that can force them to divulge the data until they are good and ready to do so. In the meantime, American television is as thoroughly smothered as though it did not exist at all, and it will continue in this state until the ruling manufacturers decide to put televisors into production or until some keenwitted independent scientist publishes the results of his cellar experiments for the benefit of a multitude of capable home-builders. At this point the question naturally arises: why is television being withheld in this country while in England everything is open and above board? Those who could answer merely talk in general terms which mean nothing, but anyone who has looked into the subject discovers only two major reasons. They are patents and income. The American radio industry is highly competitive. Patents which are basic in their scope form the point of an inverted pyramid on which huge corporations have been built. The Radio Corporation of America holds the majority of these grants. Other firms needing them must first obtain a license and then pay royalties for their use. Naturally the income to RCA from this source is tremendous. Profitable as sound broadcasting has proved to be to RCA, television admittedly holds still greater potentialities, hence this corporation will manoeuver its forces in such a manner that the patent monopoly built up in the present industry may be duplicated in the coming television phase. To do this requires extensive research, constant improvement and the development of methods of operation which are dependent on devices and systems owned and patented by the parent company. The longer a new development can be held secret and kept out of the public’s hands, the greater the opportunity to weave a patent structure which will prove unbeatable when the industry is brought out into the open, with severe competition and trade tricks to contend with. At the present time there are three main firms engaged in television activity. In addition to RCA, already mentioned, the Farns-worth Television Corporation and the Philco Radio Corporation, both of Philadelphia, are carrying on their own researches behind doors that are never penetrated except by those with the proper credentials. Each of these groups has patents which it hopes will prove to be basic when the proper time arrives. So much for the patents. Somewhat closely allied with them is the problemâ€”and incidentally the headacheâ€”created by the home-builder. Readers will remember the early days of radio when the first receivers were so costly that millions decided to make their own. It was no great task for anyone handy with screw driver and soldering iron to assemble his own equipment. In a great many instances, too, the home-built radio turned out to be definitely superior to the factory -built unit and much less expensive. Naturally, this condition brought about the formation of a host of little firms who without the formality of taking out licenses, proceeded to use circuits patented by others to produce radio sets that undersold those made by the rightful owners of the patents. Because of the small size and mobility of these fly-by-nights, as the little companies were termed, it was not an easy matter to catch them and bring them to task. In fact, today, after fifteen years of bitter litigation, thousands of sets are still being manufactured in obscure loft factories without benefit of patent licenses. It is this conditionâ€” which was and still is a nightmare to the large corporationsâ€”that the latter are striving to overcome when television comes around that corner. They know that when the first sets are placed on the market, these opportunist firms will flood the stores with television sets of doubtful quality but selling far below the cost of legitimately licensed models. Their only hope is to so perfect the instruments within the seclusion of their laboratories while strengthening their patent set-up that a high production rate and resultant lower costs will be assured from the very introduction of the models. The problem of income is likewise a serious one to these established firms. How is a manufacturer to convert his factories almost overnight from the making of all-wave receivers to televisors and do it without disrupting his elaborate sales organization? These capitalists realize that when the first television sets appear in store windows, the millions who have been thinking of replacing their obsolete i receivers with the latest models will decide to hold off until they have accumulated sufficient funds to buy the televisors. American buyers have a way of wanting the best if they can afford it or of waiting until they are able to afford it. If you discuss television with a radio executive he is likely to place the blame for the tardiness of the new industry on the program problem. He will pose the questions: Where can we find the mass of talent needed for television features? Where can we get the facilities to produce them? And â€”most important of all â€”who will stand the cost? If television is to be introduced full grown and as a going industry there is some merit in these queries. But if television were to be offered as a youngster barely able to walk, then nursed along as most such industries develop, the problems would be relatively unimportant. They would solve themselves in natural ways. In the beginning, during the novelty stage, films consisting of short subjects, news reels and the like would satisfy the first owners of televisors. Then as the number of sets in use increased, the progressive sponsor, always on the lookout for new ways to sell his product, would be certain to step in and pay the cost. Once the appeal of television has been established, even in a small way, there will be no scarcity of firms seeking to use it in the same manner they have used broadcasting. But when, the reader is asking, will television be offered to the public? There can be no definite reply to this query. It may be next month; it should be not later than next year but its advent could easily be delayed for five years or even longer. The decision to take the radio images out of the laboratory into the stores lies entirely in the hands of the several big firms whose research experts are solidifying the patent systems and whose sales wizards are studying the best means of getting the completed sets into the hands of the public with the least possible effect on the flow of profits. Those of us who have been privileged to witness modern examples of television know that its quality is good enough to “sell” today. But it is one thing to have a product that the public is begging for and quite another to want to sell that product. Only a determined public demand which expresses itself by a refusal to purchase the old line of goods will force the hands of the manufacturers. Un-American as such a move would be, it may yet turn out to be the means adopted to break down the doors of the locked laboratories and release the first flood of workable televisors to the waiting buyers of this country. The way I heard it, RCA was waiting for the Farnsworth patents to EXPIRE! In the late 1930s or early 1940s British TV transmision was suspended, fearing the shortwave signals could be used as a beacon by enemy bombers. The transmitter was turned off partway into a Walt disney cartoon. After the war when transmissions resumed, they played the rest of that cartoon from where they left off.